Temperature sensors are an important part of your network monitoring system. Then environment around your vital equipment can have a huge impact on how it operates, as well as the life span of that gear. By monitoring your remote environment, you have a better chance of preventing damage to your equipment before it is too late. It's critical that you know exactly what's going on in your server room, data center, or remote site at all times. This is one area you don't want to cut corners - you need the best for your mission-critical gear. 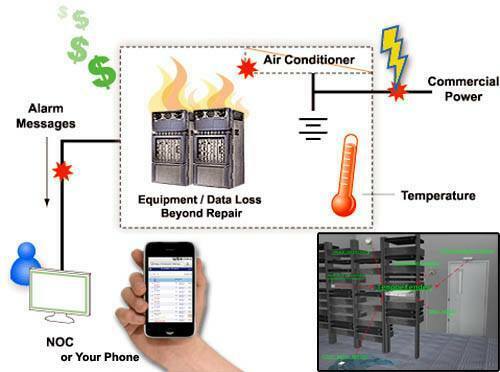 The diagram above shows a TempDefender IT monitoring device that will monitor temperature and other critical values in your server room, data center, or remote network site. There are two different ways that your temperature sensors are connected and forward alerts to the appropriate person. First are discrete sensors, which operate at a simple level - either "on" or "off". This value can also be interpreted as yes/no. Using a discrete temperature sensor to monitor your network will tell you when the temperature has risen above a specified point. These sensors are useful for simply telling you that something is out of the ordinary; however, they don't give you the precise information you need to address some problems. Using temperature as an example, a discrete sensor will just tell you that the temperature has risen above a specific temperature, not how much, just simply that it is above that specified temperature. Discrete sensors operate at a very basic level, and are simple and inexpensive; however, they do present you with very limited information about the status of your network. Second are analog sensors, which are capable of operating on either industry standard: 0-5v or 4-20mA. Your analog inputs support the basic "above" and "below" technology of discrete sensors, but are also capable of much more advanced sensor technology. By using a scale, rather than a simple on/off system, you can use analog sensors to get more valuable information. Analog sensors can also use 4-20mA temperature sensors to provide a continuous and more precise reading of the status of your server room, command center, data closet, or remote site. Put simply, analog sensors are capable of giving you the exact temperature reading (or whatever variable you choose to monitor). And like discrete sensors, analog sensors also send notifications when the temperature (or other variable) exceeds your predetermined levels. A good remote terminal unit (RTU) will give you the option to customize these values, so you get the exact monitoring functionality you need. How do I Choose Between Discrete and Analog 4-20mA Temperature Sensors? You now have the basic understanding of sensor types - now it's time to pick the right sensor for you and your business. While very basic, sometimes discrete temperature sensors are just the right fit. If, for example, you just want to know if the power to one of your remote sites is on, a discrete sensor with on/off or yes/no type information will do the job. If you need to know the exact temperature of your server room, for example, having a discrete sensor won't give you the information you need. Analog sensors are the right choice for you when you need detailed descriptions of exactly what's happening at your remote site. These sensors provide you with 24/7 visibility to the monitored sites on your network. If you're concerned about things like the temperature of your computer room, humidity level, the wind speed outside your remote site, or the water levels of your infrastructure, you need the functionality of 4-20mA temperature sensors. You simply can't afford preventable, network downtime. "The NetGuardian 832A monitors 32 discrete alarms and 8 analog alarms to give you the alarm options you desire." You can make the right choice to guarantee your network's security. There's no understating the satisfaction of knowing that you're not taking the unnecessary risk of leaving your network improperly monitored. You simply can't afford to equip your network with the wrong monitoring tools, or even worse, no monitoring tools at all. The risks and costs are too great - critical damage, lost revenue, or disgruntled customers taking their business elsewhere. To fully protect your network, I suggest you take a look at a few different devices. First, the TempDefender IT is a powerful and compact temperature monitoring device that provides you with the option of using discrete or analog sensor technology. If your monitoring needs are very extensive, the NetGuardian 832A with a Vaisala Temperature/Humidity Sensor gives you the powerful control you need over your network. Both of these sensors can provide you with the 4-20mA temperature sensor technology your network needs as well as the functionality of an RTU. If you have any questions, want more information, or would like to know how you can get setup with your own TempDefender IT or NetGuardian 832A call DPS Telecom at 1-800-693-0351 to speak with a temperature sensor expert. You may also email the DPS experts at sales@dpstele.com for more information about temperature sensors. It's 1:47 PM on Thursday at our Fresno, CA, USA headquarters. We can start on your quote right away.